Facebook Groups are better for smaller groups of know people who are invited to join. Groups only have one administrator and content posted by the administrator appears to come from that individual not the entity. Groups could work well for a class or a working group. Groups can be “open,” “closed” or “secret,” depending on who should have access. 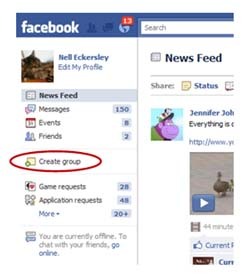 You can create a group by clicking on the “Create a Group” link which usually shows up halfway down the left side of your Facebook Home screen.